Maple syrup is made from the xylem sap of one of the three maple tree varieties: sugar maple, black maple, or red maple. It was first collected by the indigenous people of the northeastern part of North America. European settlers adopted this practice. In the 1970s the maple syrup production increased due to technological improvements that refined production methods. The largest producer of maple syrup is the Canadian province of Quebec. The provinces of Nova Scotia, Prince Edward Island, New Brunswick, and Ontario also produce syrup. The largest producer in the United States is Vermont. Marketable quantities of syrup are also produced by New York, Maine, Ohio, Wisconsin, and some other states. 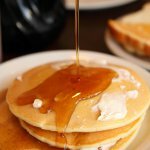 Maple syrup is praised for its unique flavor. It is widely used in cooking as a flavoring agent, a sweetener, a topping, and an ingredient in baking. To celebrate the National Maple Syrup Day, cook waffles, pancakes, crepes, or French toast for breakfast and top then with delicious maple syrup. You can also add some syrup to your tea instead of sugar, it will taste delicious.